If you're shopping for a child who has expressed interest in learning to sew, it's important to find the perfect first sewing machine. Kids' sewing machines have come a long way over the years, and there are a lot of options on the market. Toy sewing machines are a good option if you're shopping for a younger child. These machines usually sew a simple chain stitch, which is all that's required for a basic seam. The durability of the stitching varies significantly, and users sometimes complain about being able to pull the stitches out by hand. These machines are very affordable, usually ranging in price from $30 to just under $100. The Singer Totally Me Zig-Zag Sewing Machine features a safety shield on the needle and several accessories. Its pink and purple coloring makes it a popular choice for little girls. However, online comments about the product indicate that the stitches come out easily. The Barbie Lightweight Portable Sewing Machine is a good option for a beginning sewer. It features a speed control, which can be especially helpful when children are first learning to sew. Reviewers praise this model's quality. The next step up from a toy sewing machine is a smaller-sized adult machine. Although you'll pay a little more for this type of product, usually between $50 and $150, it's well worth the extra money if you feel your child is likely to become serious about sewing. These machines are made by the same manufacturers as regular adult sewing machines. They can usually perform several simple stitch functions, which makes them great for older children who want to put in zippers or machine stitch hems on doll clothes. The Kenmore Mini Ultra ¾ Size Sewing Machine is an affordable option for older kids, and it has the capabilities of an adult machine. It can sew through denim, make buttonholes, and reverse stitch. Users rave about this option as a starter machine for kids. The Singer 8-Stitch Sewing Machine accommodates a variety of fabric weights and has an easy-to-use horizontal thread feeder. It gets great reviews from users, and the simple mechanical functioning is perfect for beginning sewers. The Brother LS2125I Easy-To-Use Lightweight Basic 10-Stitch Sewing Machine is also popular as a first machine for kids. Users love the easy-to-wind bobbin and the quick-change capability for the various feet. 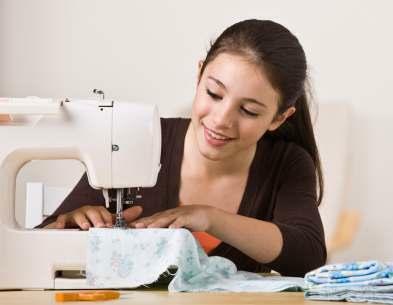 If you're on a budget but still want your child to start sewing on a real sewing machine, consider buying used. Sewing machines last for years, and some of the older models are actually simpler than today's computerized options. Look for used machines in your newspaper classified ads and at thrift stores. Buying a used sewing machine online at an auction site is sometimes an option as well, but due to its weight, shipping the machine can get expensive. Depending on how much you're paying, consider having the machine examined by a sewing machine service professional. You can have the whole thing oiled and cleaned so it will stay in good working order. Consider buying a needle protector if one is available for your machine. These units fit over the needle and keep little fingers from coming in contact with the sharp equipment. Look for a machine that is lightweight. A lot of older machines are very heavy, making them hard for children to maneuver. If your child will not have a dedicated sewing station, this could be a concern. Whether you select a used machine, buy a three-quarter-sized model, or purchase a toy machine, your child is sure to love learning to sew. In addition to the special sewing experiences you'll share, the skills your child learns now will last a lifetime.